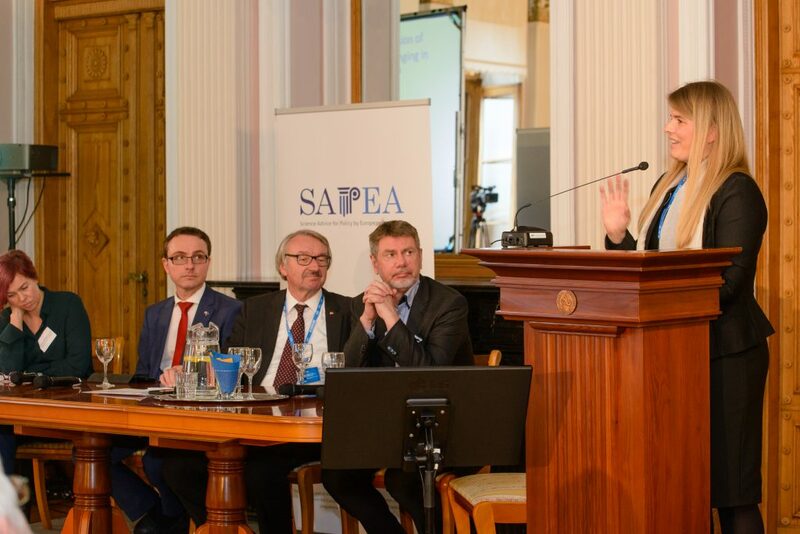 On 13 October 2017 SAPEA organised a one-day symposium titled Crossing Boundaries: New approaches to science for policy in Europe at the Estonian Academy of Sciences in Tallinn. The event was designed to complement the international conference “European Research Excellence: Impact and Value for Society” taking place the day before (see below). Both events took place as part of the programme of the Estonian Presidency of the European Council. Bringing together speakers from the policy sphere, the private sector, social enterprise, the media and the academic community, the conference explored opportunities and challenges in science for policy together with an international audience of participants. ALLEA President and Chair of SAPEA Günter Stock introduced the conference, noting the need for interdisciplinarity in the challenges facing decision makers today. He also expressed a wish to broaden the discussion beyond academia, looking at other sectors that are affected by policy making – from NGO’s to business perspectives. In four well attended sessions speakers and participants explored change in science for policy, the need to improve relationships between the different stakeholders and the need to develop inclusive communities, to share best practice. Throughout the day, speakers shared diverse views on the participation of citizens and their impact on science for policy, how policy makers and scientists are changing their approach to working with each other, and the role of NGO’s and business in science for policy. The international line-up of speakers included Professor Dame Helen Wallace who set the scene with a keynote speech examining the international landscape for science policy, TV presenter and academic Professor Brian Cox, head of the SAM unit Dr Johannes Klumpers, Member of European Parliament Dr Marju Lauristin and Professor Janusz Bujnicki, Member of the Scientific Advice Mechanism High Level Group. A write-up from the event will be available soon on the SAPEA website.